I love a good flowchart. I like graphs. And lists. And filling in forms. And parallel remote controls. But I really love flow charts. 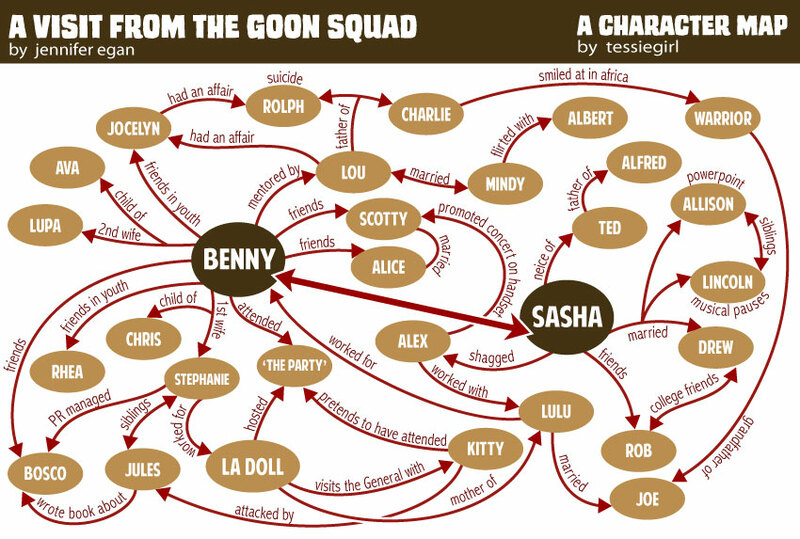 So, when I finished the novel 'A Visit From the Goon Squad' by Jennifer Egan yesterday, I thought "I need to make a damn flowchart of that!!" This book was awesome. Music, New York, punk, youth, despair, theft, Powerpoint presentations and a billion interconnecting characters who hook up across decades, continents and time. Ever since I saw Robert Altman's 'Shortcuts', I have loved the seemingly disjointed, that becomes a chain of connections that cross and link back on themselves. Lovetey love, love love. I also loved the concepts within the book around the passage of time, of ageing, of wondering who you have become and who were you in the first place. And how awesome is a book with a whole chapter written as a Powerpoint presentation? I'll tell you how awesome- Totally. Have you read 'A Visit From the Goon Squad'? If not, why not?!? Oh please, please, PLEASE map your friendship group! Ang- I'm on it. Get ready to be mapped, baby! thanks Lady Doo Da. I think u will be seeing more flow charts... I feel a new obsession coming on! I wonder if I can make money from flow charts?!?! Only you, dear friend could make a practical flow chart beautiful and necessary. Hey I'm back!! Just letting you know I love your blog so much I've given you an award!! THANK YOU! I just finished this fabulous book and thought, "I wish i had made, like, a flow chart or something of all these characters." 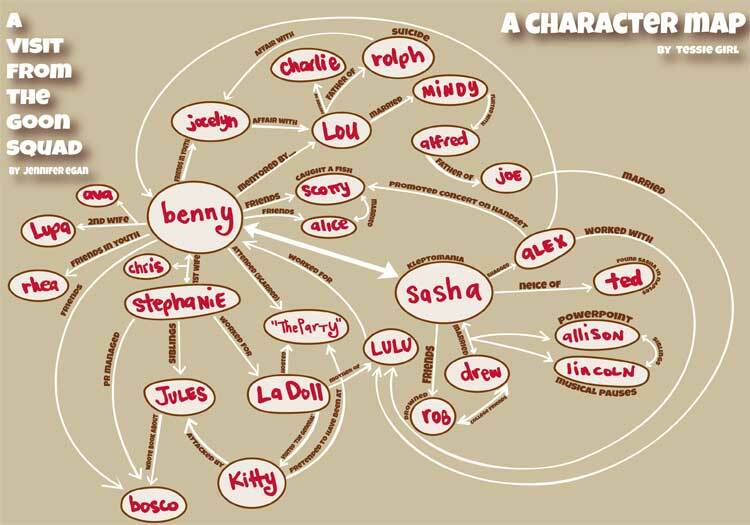 So i google the book's character list and your beautiful chart pops up! Perfect! Well done ! I read it and really appreciate your immensely helpful chart ; one of my many reactions to the book was "My brain hurts"
Our bookclub just read this book - and we all loved your flowchart! I have linked to it in our minutes from that month's meeting. I hope you don't mind? If you do, please leave a comment and I'll remove it. This is terrific--funny and charming! are you sure alfred is the father of joe? I did the exact same thing on my dry erase board at home while i was reading egan's novel. one note- alfred did not father joe. page 47 in the hard back. Joe isn't Alfred's son. He's the son of an African warrior that Charlie exchanges glances with while on the Safari. Found this recently and what a help it was! Rated Best SEO Company in Faridabad, Haryana, we offer quality Digital Marketing and SEO Services. Contact the #1 SEO Services Company in Faridabad for SEO charges.